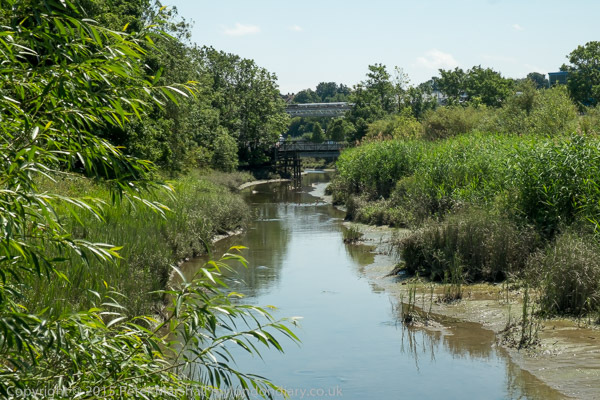 It was a hot summer day (something I’ve not too often had the chance to write this year) when we took the train to Dartford to complete a walk along the Darent Valley Path to the mouth of the River Darent, and then along by the Thames to Greenhithe. Dartford has change considerably over the years, and the industries that dominated the north of the town when I first walked this way back in the 1980s have now gone, and most of their buildings too, though as yet little has replaced them. The picture I took back in 1985 was from the railway station, or rather through the open window of a train at Dartford Station, and the building in it has now gone completely. 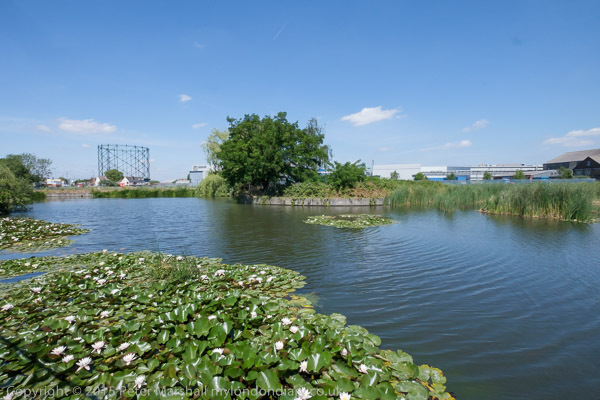 The pond still remains, and I photographed it through the railings on Mill Pond Rd, looking to the left of my older image. The view straight ahead was rather empty. Hythe St and The Huffler’s Arms in the top image didn’t seem to have changed a great deal, though I didn’t have time to stop to admire its interior. But the pub was as reminder that Dartford had been a port, with boats coming up the river from the Thames to wharves here. You can see the back of the building facing the pond at the right of this picture. 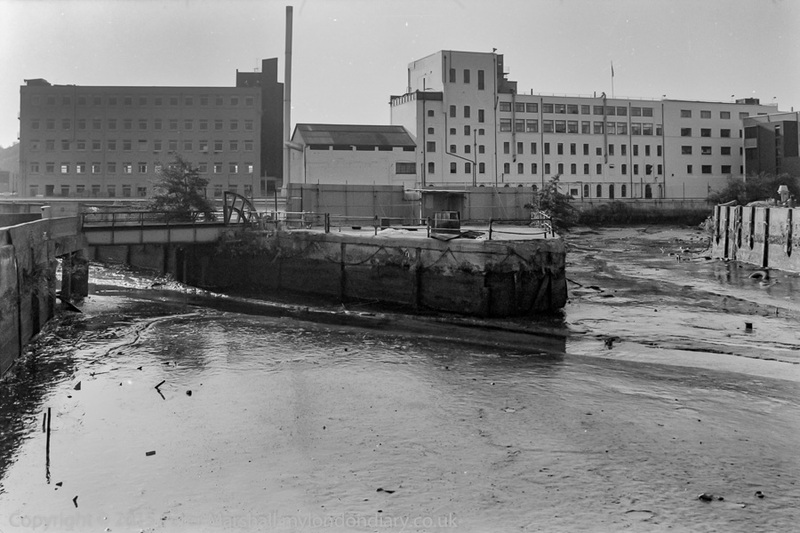 It was quite hard to see exactly where I had taken some of those pictures back then, with little but the river remaining, though some were readily identifiable. 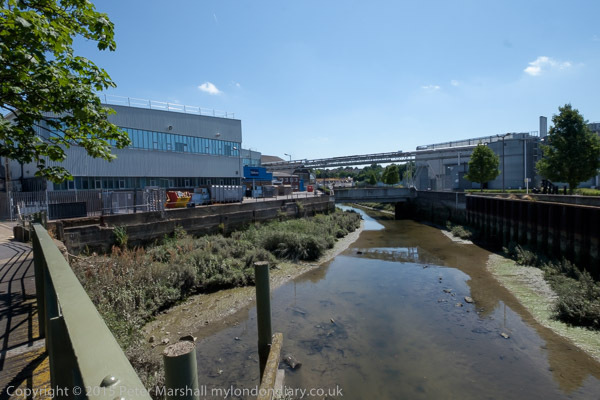 A public slipway next to the bridge taking the footpath across the river here was cleared by the Friends of Dartford and Crayford Creek and the first boat launched here for decades in March 2015. Although I know I walked along this footpath, before that I think I had gone into the large car park for the pharmaceutical works and perhaps on to a bridge higher upstream, but Glaxo or GSK (as Welcome became) had filled in and built over much of the basin and culverted streams in the years between my visits. I think I was last around here at the start of 2013, though I’m not sure if I walked this path then. 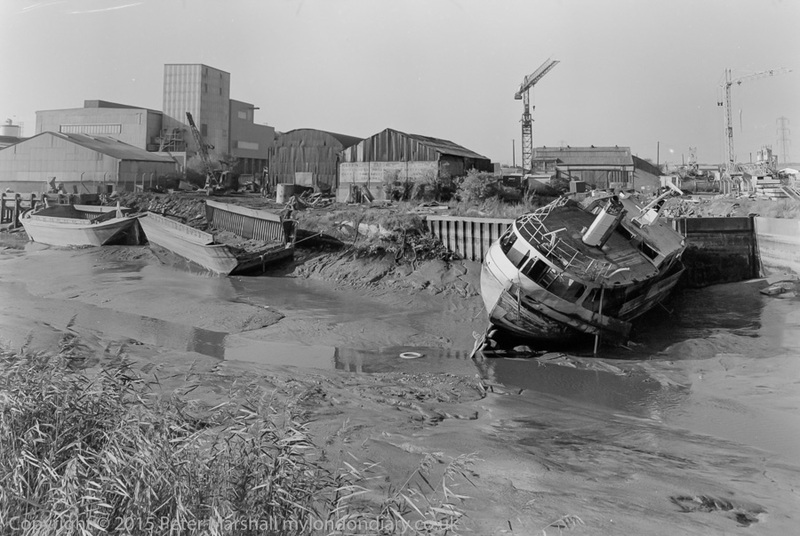 Back in 1985, there was still considerable evidence of the navigable waterway, but the Dartford & Crayford Navigation (Dartford Creek) was essentially completely abandoned the following year, and the low Dartford northern bypass bridge opened in 1994 makes navigation tricky. 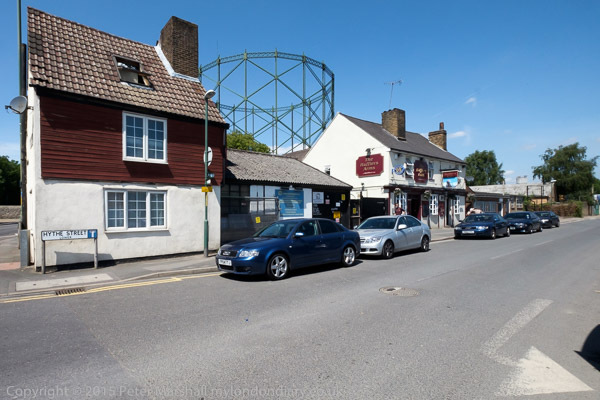 Back in 2006, some intrepid sailors managed to get a narrow boat up to Dartford showing it was still possible – and on their way out they also explored the short arm of the Crayford Navigation. The creek banks are now overgrown close to the centre of Dartford. Even back in the old days, navigation was not straightforward, and teams of men were needed to assist the passage of boats, particularly against the tide. Ufflers (or Hufflers) were men with very long poles – perhaps 15 ft – that they could put in the mud to get a purchase as they pulled barges along the creek to the wharves, and were of particular use on those creeks where no suitable towpath for horses existed. Usually they worked in pairs or sometimes three men together. Probably from Dartford they would be needed to take the barges down against a rising tide to arrive at the mouth of the river near high water so they could enter the Thames. Pictures from a previous walk from Eynsford to Dartford, mainly along the Darent Valley Path are at Walking the Darent Way and you can see the pictures from this section (and the continuation to Greenhithe) at Darent Valley Path & Thames. Black and white pictures in this post were taken in 1985 using an Olympus OM1 and Ilford XP1 film. Most of the pictures I was taking at the time were made the the Olympus Zuiko 35mm f2.8 shift lens, long my favourite lens and still one of the best lenses made for 35mm – it has a 62mm image circle rather larger than the 43mm needed to cover the full frame which gives it an advantage, and easily slides to project any 36×24 rectangle of that larger circle onto the film. After years using it, I still sometimes find myself trying to slide other lenses. Of course we can now correct perspective in Lightroom or Photoshop, but it isn’t quite the same, and I sometimes find myself wishing I still had a lens with movements. It would of course be easy to fit the OM lens with an adapter to the Fuji-X cameras that I was using for the colour images here (with Fuji 10-24 and 18-55mm lenses) but on the smaller sensor it would be a 53mm equivalent rather than a wide-angle, and the shifts of much less – if not zero- use. But I’ve just found and started to read a test of this and some other ‘PC’ lenses on a Canon full-frame body. Fitting OM lenses to a Nikon is kind of possible, but probably not for the 35mm shift. I don’t think Fuji will come out with a full-frame X series camera. There would be little in it for them (or for photographers given how well the 1.5x cameras work.) Full-frame is largely a matter of prestige rather than performance, and Nikon were right when they said the APS-C format could deliver the goods – even though they ate those words a few years later. Almost none of us needs full-frame except once in a blue moon. 99% of the images I make with the D810 (and before that with the D800E) I make on the smaller format, despite now having a full frame lens on the camera. If Fuji ever do make the leap, like Nikon it will be for marketing rather than photographic reasons. This entry was posted on Saturday, October 24th, 2015 at 10:17 am and is filed under My Own Work, Photo Issues. You can follow any responses to this entry through the RSS 2.0 feed. You can leave a response, or trackback from your own site.